Happy New Year's Day- Welcome to 2014!!! Today is inauguration day all across the nation in numerous local municipalities. New York City is no exception! Today marks the beginning of a long over due changing of the guard, for New York City. Mayor Bloomberg finally departed City Hall last evening after twelve long years in office. 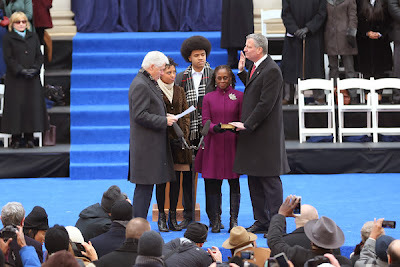 At midnight, the former Public Advocate of New York City Bill deBlasio, was sworn in as the 109th Mayor of New York City. deBlasio seems to have a full understanding of the important work he has been tasked with and the desperate need for a change in tone by the city's top office. At noon today, for the first time in a very long time, New Yorker's were given access to the mayor via his pubic swearing in ceremony on the steps of City Hall. Apparently, (I was unaware) our city has not had the privilege of participating in general public inaugural activities for a very long time. Understanding the importance of starting his job with the right tone, Mayor deBlasio and his transition team put together an inaugural program that was intended to be very inclusive and a visual display of our city's diversity. 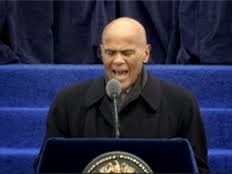 (00:16:01) Harry Belafonte gave an opening address in which he called on the new mayor to end "Stop and Frisk." He did so eloquently and even eluded to the fact that our new mayor will have a different prospective on race relations in our city, because he is a Caucasian male, with a black wife and bi-racial children. Mr. Belafonte also called on all New Yorker's (regardless of race, creed, gender or political affiliation) to support the mayor as he begins the difficult work ahead. The speech is what you would expect of Harry Belfonte. (00:22:31) Then came a prayer from chaplains of numerous faiths, representing various city agencies. Selected first to make his delivery was Reverend Fred Lucas Jr. who serves as the chaplain to the Department of Sanitation. I am unable to locate the text of Reverend Lucas' prayer, but some of the words used were shackles, plantation, crooked, emancipation proclamation, and reconstruction. The reverend referred to New York City as "the plantation called New York City." I don't know anything about Reverend Lucas so it's difficult for me to gage whether or not the prayer he delivered today was in alignment with his usual sermons, or if today's prayer was something special that he pulled out of his hat. To be honest, I was very disgusted by the numerous references to slavery that we witnessed in 2013. We all know the displaceable and heinous institution that it was and the stain it's left on our nation's history. Today, we still see the effects of slavery in our communities. Personally, I am very versed in the income inequalities that exist today. I am also versed in the issues that exhist in New York City. There was no need for Reverend Lucas to use this opportunity to make erroneous references to slavery, with regards to the present conditions of New York City. I'm not going to tolerate this behavior from Sarah Palin or Phil Roberston, so i'm certainly not going to tolerate it from Reverend Lucas. I'm interested to hear your thoughts on Reverend Lucas' speech and the upcoming deBlasio administration. Was Reverend Lucas' speech appropriate for Mayor deBlasio's Inauguration?